PSG (51) are now only 3 points clear to Lyon (48). Marseille (46) remain 3rd and Nice have moved upto 4th (42). At the bottom, Nancy (18), Troyes (19) & Evian (23) occupy the relegation slots with Evian a point behind Reims. Juventus (58) & Napoli (52) remain 1st and 2nd respectively. Lazio (47), Milan (45) & Inter (44) make up the top 5. Palermo (20), Pescara (21) & Siena (21) occupy the relegation slots with Siena 5 points behind Genoa. Barcelona (68), Atletico Madrid (56) & Real Madrid (52) remain 1st, 2nd & 3rd respectively. Malaga (42), Valencia (41), Real Sociedad (40) & Betis (39) make up the top 7. Deportivo (16), Mallorca (18) & Celta Vigo (23) occupy the relegation slots with Celta Vigo 2 points behind Zaragoza. Bayern Munich (60), Borussia Dortmund (43), Bayer Leverkusen (42) & Eintracht Frankfurt (38) make up the top 4. Freiburg (35) & Hamburg (34) occupy the Europa League slots. At the bottom, Augsburg (18) occupy the relegation playoff position 9 points behind Wolfsburg. Hoffenheim (16) & Greuther Furth (13) occupy the relegation slots. PSG (54) & Lyon (51) make up the top 2. Marseille (46) remain 3rd and Nice remain 4th (45). At the bottom, Nancy (18), Troyes (20) & Evian (23) occupy the relegation slots with Evian a point behind Reims. Juventus (59) & Napoli (53) remain 1st and 2nd respectively. Milan (48), Lazio (47) & Inter (47) make up the top 5. Palermo (21), Pescara (21) & Siena (21) occupy the relegation slots with Siena 5 points behind Genoa. Barcelona (68), Atletico Madrid (57) & Real Madrid (55) remain 1st, 2nd & 3rd respectively. Malaga (43), Valencia (42), Real Sociedad (41) & Betis (40) make up the top 7. Deportivo (17), Mallorca (21) & Celta Vigo (23) occupy the relegation slots with Celta Vigo 2 points behind Zaragoza. Bayern Munich (63), Borussia Dortmund (46), Bayer Leverkusen (45) & Eintracht Frankfurt (38) make up the top 4. Freiburg (36) & Schalke (36) occupy the Europa League slots. At the bottom, Augsburg (21) occupy the relegation playoff position 9 points behind Wolfsburg. Hoffenheim (16) & Greuther Furth (14) occupy the relegation slots. PSG (54) & Lyon (52) make up the top 2. Marseille (49) remain 3rd and St Etienne have moved upto 4th (47). At the bottom, Troyes (20), Nancy (21) & Evian (24) occupy the relegation slots with Evian a point behind Sochaux. Juventus (62) & Napoli (53) remain 1st and 2nd respectively. Milan (51), Fiorentina (48) & Inter (47) make up the top 5. Palermo (21), Pescara (21) & Siena (24) occupy the relegation slots with Siena 2 points behind Genoa. Barcelona (71), Real Madrid (58) & Atletico Madrid (57) remain 1st, 2nd & 3rd respectively. Malaga (44), Real Sociedad (44), Real Betis (43) & Valencia (42) make up the top 7. Deportivo (17), Celta Vigo (23) & Mallorca (24) occupy the relegation slots with Mallorca 2 points behind Zaragoza. Bayern Munich (66), Borussia Dortmund (46), Bayer Leverkusen (45) & Schalke (39) make up the top 4. Eintracht Frankfurt (39) & Hamburg (38) occupy the Europa League slots. At the bottom, Augsburg (21) occupy the relegation playoff position 7 points behind Fortuna Dusseldorf. Hoffenheim (19) & Greuther Furth (14) occupy the relegation slots. PSG (57) & Lyon (53) make up the top 2. Marseille (50) remain 3rd and St Etienne remain 4th (48). At the bottom, Nancy (21), Troyes (23) & Sochaux (27) occupy the relegation slots with Sochaux level on points with Evian & Reims. Legend Andres Iniesta will leave Barcelona,No longer a rumors !!! Speaking at the press conference he said: “This is my last season here (On Apr 27, 2018). 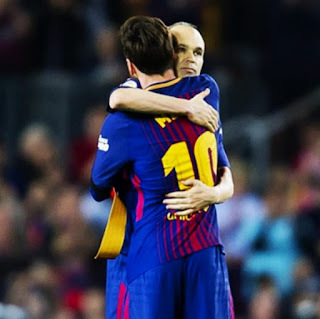 Struggling to hold back the tears, Iniesta said : “I understand that in the near future I will not be able to give the best of myself in all senses, both physically and mentally. "The Spanish midfielder, who has made 639 appearances for arça, ranks second on the all-time games played list at the Club. He has scored 55 goals for the first team, for which he debuted on October 29th, 2002. 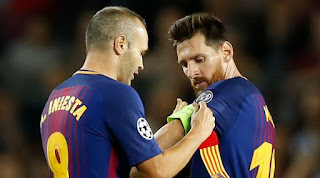 From Qatar and to Australia, through China, the United States and England, Iniesta had a choice, although in the possibility of continuing in Europe, he discarded it in first person from the very beginning. 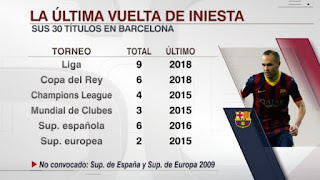 Iniesta, 34 years old and with 32 titles won at Barça, besides being world champon and twice from Europe with Spain, will be from now on the reference player of Vissel Kobe and one of the top attractions of the J -League.